3 Membership (GBC). This is considered the starting point to a career as a psychologist. 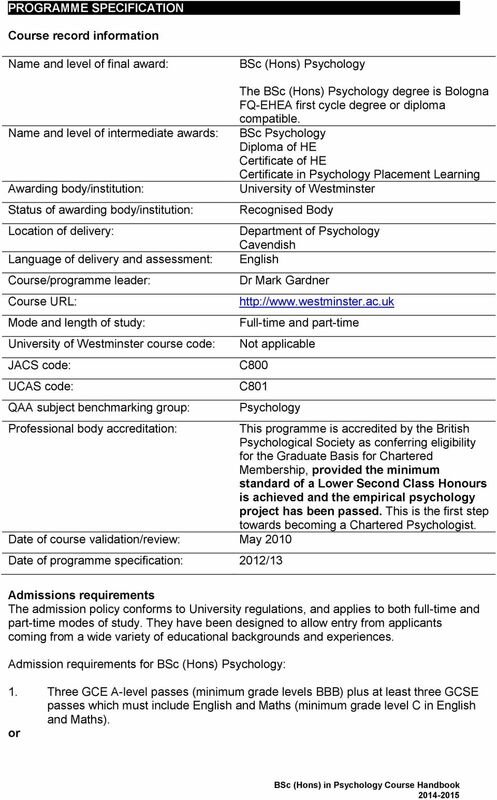 It opens up further study opportunities because GBC is an entry requirement for all BPS accredited postgraduate courses providing specialist training for professions such as Clinical, Forensic or Educational Psychology. Today s organisations need graduates with both good degrees and skills relevant to the workplace, ie employability skills. The University of Westminster is committed to developing employable graduates by ensuring that: Career development skills are embedded in all courses; Opportunities for part-time work, placements and work-related learning activities are widely available to students; Staff continue to widen and strengthen the University s links with employers in all sectors, involving them in curriculum design and encouraging their participation in other aspects of the University s career education and guidance provision; Staff are provided with up-to-date data on labour market trends and employers requirements which will inform the service delivered to students. 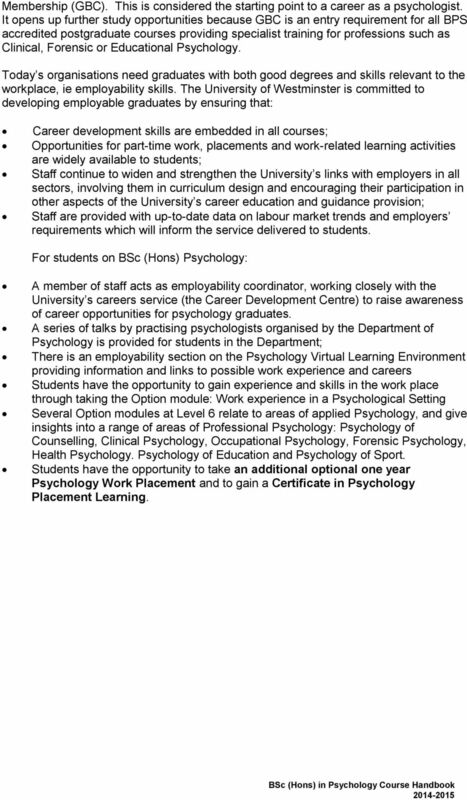 For students on BSc (Hons) Psychology: A member of staff acts as employability coordinator, working closely with the University s careers service (the Career Development Centre) to raise awareness of career opportunities for psychology graduates. 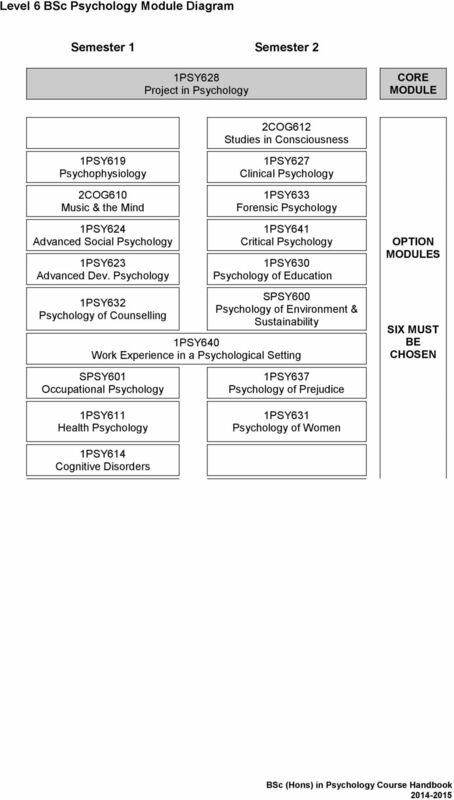 A series of talks by practising psychologists organised by the Department of Psychology is provided for students in the Department; There is an employability section on the Psychology Virtual Learning Environment providing information and links to possible work experience and careers Students have the opportunity to gain experience and skills in the work place through taking the Option module: Work experience in a Psychological Setting Several Option modules at Level 6 relate to areas of applied Psychology, and give insights into a range of areas of Professional Psychology: Psychology of Counselling, Clinical Psychology, Occupational Psychology, Forensic Psychology, Health Psychology. 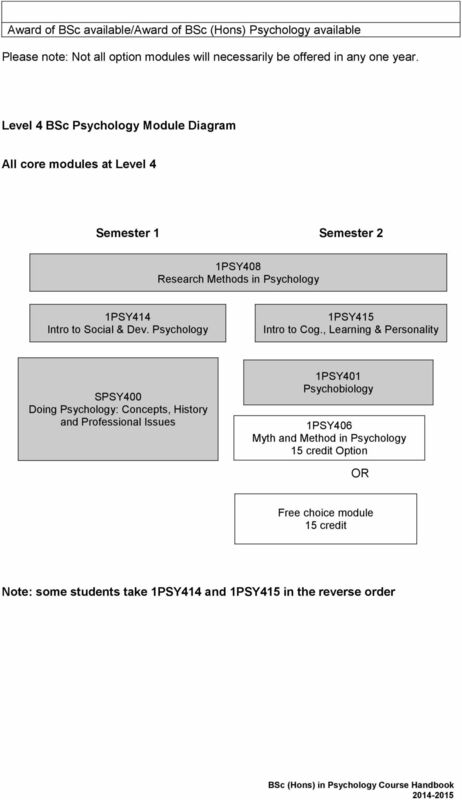 Psychology of Education and Psychology of Sport. 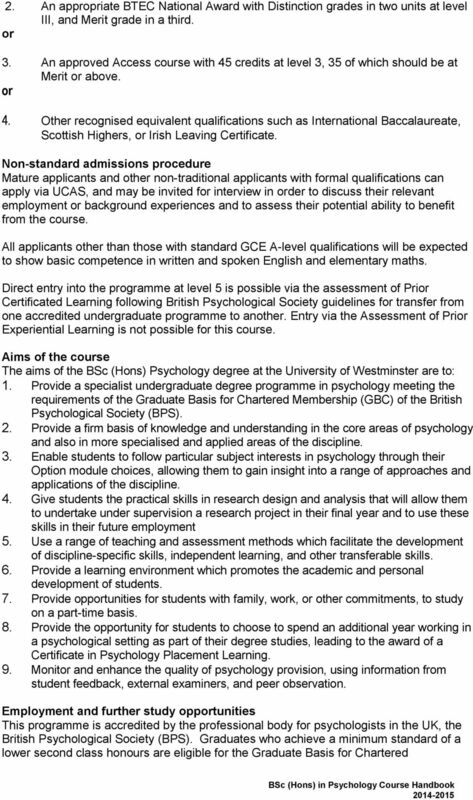 Students have the opportunity to take an additional optional one year Psychology Work Placement and to gain a Certificate in Psychology Placement Learning. 7 8. Be sensitive to and react appropriately to contextual and interpersonal factors in groups and teams 9. Undertake self-directed study and project management in a supportive environment 10. Carry out a comprehensive literature research of a given topic using a wide range of resources and show awareness of the validity of material collected 11. Reflect, evaluate and act on personal strengths and weaknesses 1PSY628, Option modules 1PSY628 1PSY628, 1PSY640, Psychology Work Placement Year Learning, teaching and assessment methods Learning Students learn to use a range of strategies for study and learning from the outset of their degree in weekly seminar/practical sessions associated with each module. 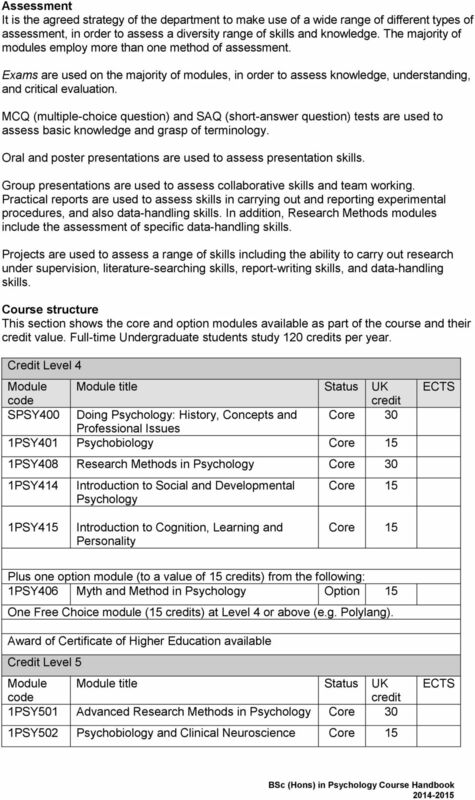 The 30 credit Doing Psychology: History, Concepts and Professional Issues will support students acquisition of appropriate IT and literature research skills, critical reading skills and the linking of these skills to personal development planning. Good written communication skills are fostered through feedback on written assignments. 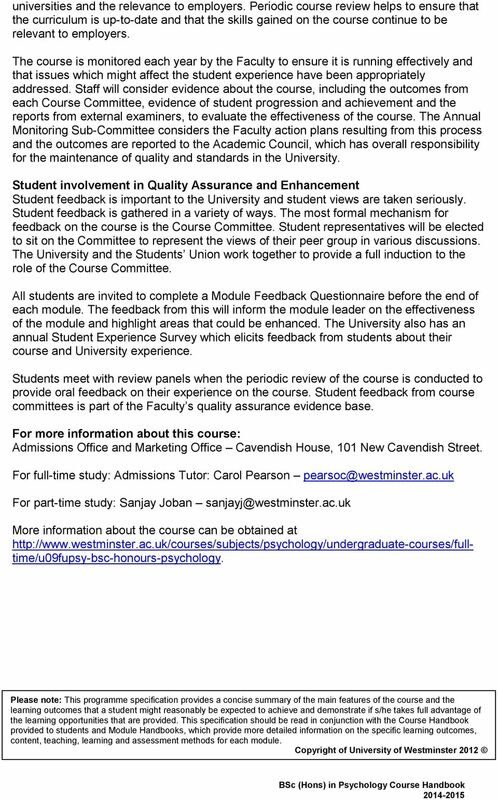 We have developed feedback sheets that indicate to students how they can improve on subsequent assignments. A number of assessments encourage students to learn oral presentation skills. 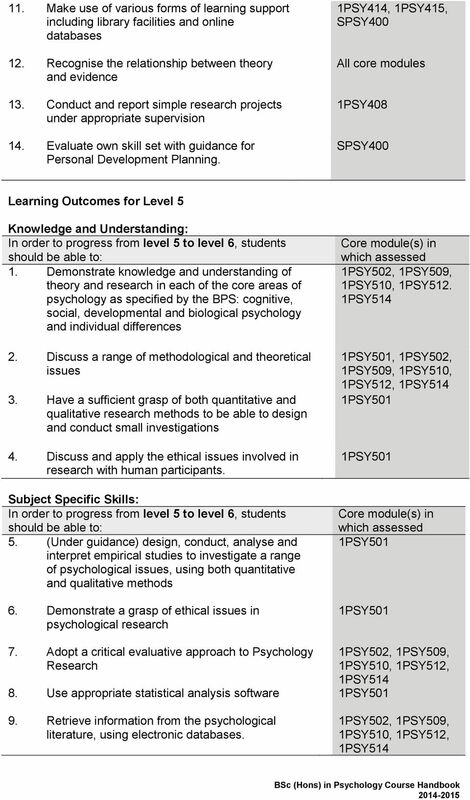 As students progress through the course they develop more and more independence in their learning, culminating in the individualised research project. Students are encouraged to reflect on their learning and the skills they gain through the process of personal development planning. 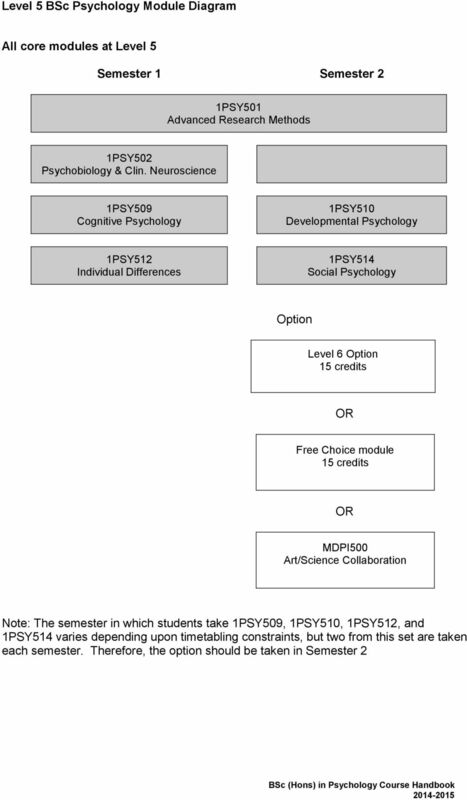 For students on the Optional Work Placement Year, the opportunity for experiential learning is provided, under supervision, in a psychology-related setting. 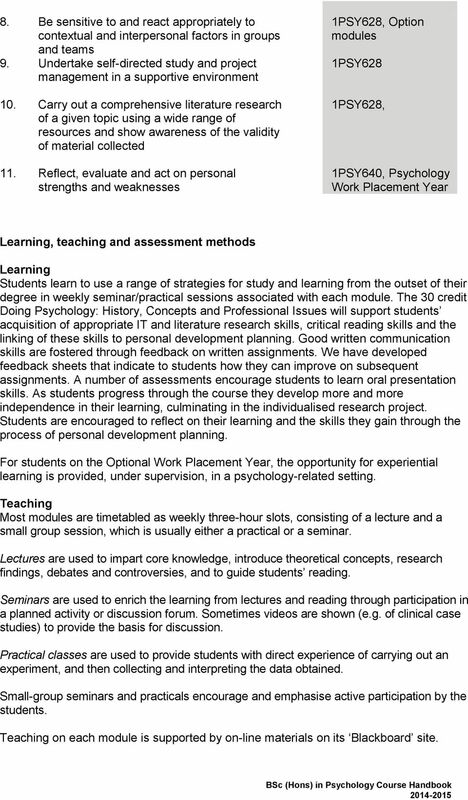 Teaching Most modules are timetabled as weekly three-hour slots, consisting of a lecture and a small group session, which is usually either a practical or a seminar. Lectures are used to impart core knowledge, introduce theoretical concepts, research findings, debates and controversies, and to guide students reading. Seminars are used to enrich the learning from lectures and reading through participation in a planned activity or discussion forum. Sometimes videos are shown (e.g. of clinical case studies) to provide the basis for discussion. Practical classes are used to provide students with direct experience of carrying out an experiment, and then collecting and interpreting the data obtained. Small-group seminars and practicals encourage and emphasise active participation by the students. Teaching on each module is supported by on-line materials on its Blackboard site. 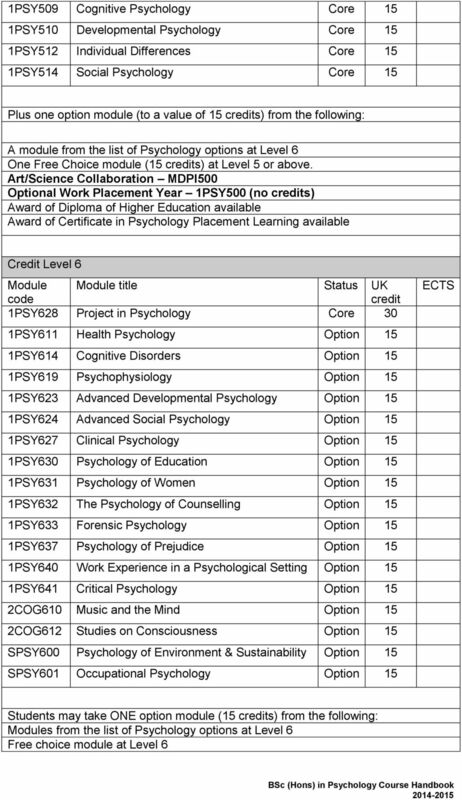 13 Award To qualify for the award of BSc (Hons) Psychology, a student must have: obtained at least 360 credits including: passed 75 credits at credit Level 4 or higher and achieved at least a condoned credit in each of the remaining modules worth 45 credits at Level 4; and passed a minimum of 120 Credits at credit Level 5 or higher; and passed a minimum of 120 credits at credit Level 6 or higher. 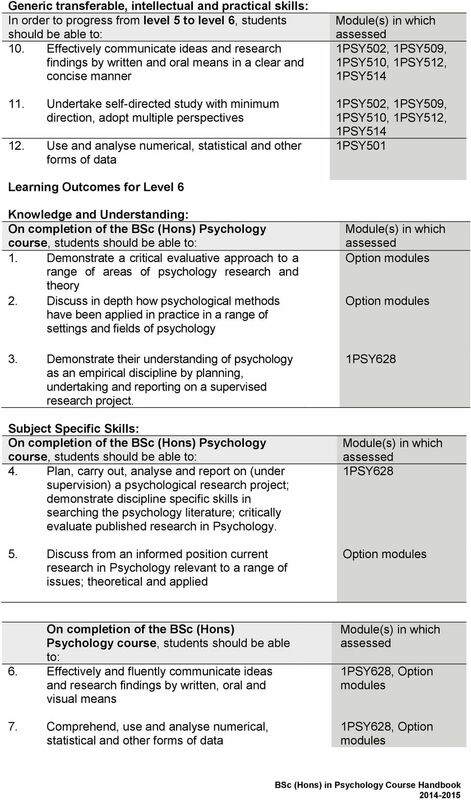 attempted modules with a maximum value of 330 credits at credit Levels 5 and 6; and satisfied the requirements contained within any course specific regulations for the relevant course scheme. 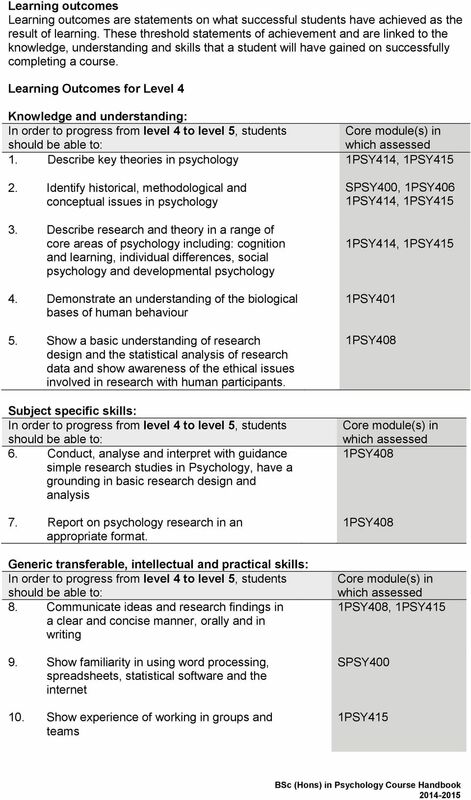 The class of the Honours degree awarded is decided by two criteria, the average of the best 105 credits passed at credit Level 6 being in the range of the class to be awarded, and the average of the next best 105 credits passed at credit Levels 5 and 6 provided the next best 105 credits passed are no more than one classification below this. 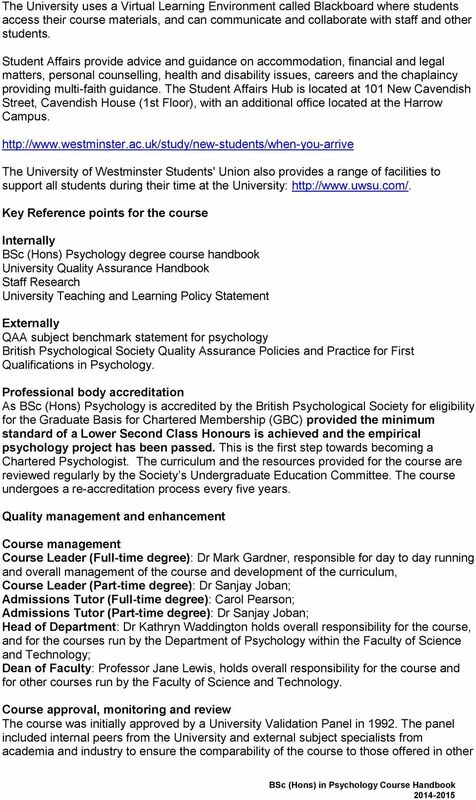 Academic regulations BSc (Hons) Psychology and its intermediate awards operate in accordance with the University's Academic Regulations and the Framework for Higher Education Qualifications in England, Wales and Northern Ireland published by the Quality Assurance Agency for Higher Education (QAA) in All students should make sure that they access a copy of the current edition of the general University handbook called Essential Westminster, which is available at westminster.ac.uk/essential-westminster. 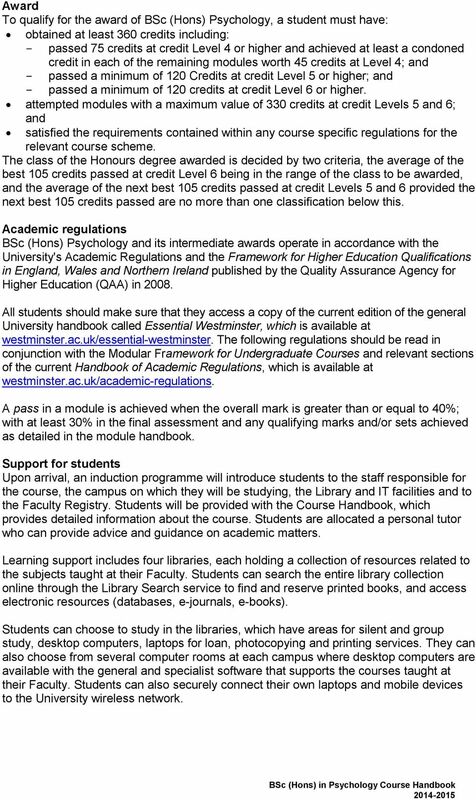 The following regulations should be read in conjunction with the Modular Framework for Undergraduate Courses and relevant sections of the current Handbook of Academic Regulations, which is available at westminster.ac.uk/academic-regulations. A pass in a module is achieved when the overall mark is greater than or equal to 40%; with at least 30% in the final assessment and any qualifying marks and/or sets achieved as detailed in the module handbook. Support for students Upon arrival, an induction programme will introduce students to the staff responsible for the course, the campus on which they will be studying, the Library and IT facilities and to the Faculty Registry. Students will be provided with the Course Handbook, which provides detailed information about the course. Students are allocated a personal tutor who can provide advice and guidance on academic matters. Learning support includes four libraries, each holding a collection of resources related to the subjects taught at their Faculty. Students can search the entire library collection online through the Library Search service to find and reserve printed books, and access electronic resources (databases, e-journals, e-books). Students can choose to study in the libraries, which have areas for silent and group study, desktop computers, laptops for loan, photocopying and printing services. They can also choose from several computer rooms at each campus where desktop computers are available with the general and specialist software that supports the courses taught at their Faculty. Students can also securely connect their own laptops and mobile devices to the University wireless network. PROGRAMME SPECIFICATION Course record information Name and level of final award: BA (Hons) Journalism BA (Hons) Journalism is a BA (Hons) degree that is Bologna FQ-EHEA first cycle degree or diploma compatible.